One of the must haves when running is my phone. I run with it for safety and of course, to stop and take a picture. You never know when you'll see something great on the side of the road or when I have to take a selfie. Runner priorities. I had this old arm band for the original iTouch I bought Ward years ago, so I've been using that running armband for my iPhone. Well, sometimes. It's horrible. It's hard to get my phone in and out of it. It's not water resistant at all. And there's no room to carry other things in it. Very frustrating. Which lead to me simply carrying my phone. With my hands. And I was okay with that. It was quite easy to take a picture because I already had the phone in my hand. But there was one problem. A pretty major one and I didn't even notice until my brother-in-law saw me running one day and asked me why I didn't use my arms when I run. Hmmmm...... I thought I was using my arms. I have many pictures of myself from races and I'm definitely using my arms. So, when did it happen? When did I stop using my arms. After thinking about it for a bit, I realized that the not running with my arms must have started when I started running with my phone in my hand. Well that's not good. No wonder my legs aren't happy. They are being overworked and my arms aren't doing a darn thing. Well, they are holding a phone and taking pictures but they aren't doing their job when I'm running. This must be fixed. 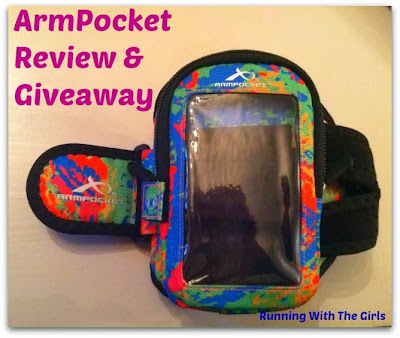 Then came the opportunity to review ArmPocket and my entire running world changed - for the better. I could run with my iPhone, not in my hand and I could use my arms when I run. Awesome! At first I thought I wanted a larger ArmPocket, but after consulting with Amanda at ArmPocket, we came to conclusion that the smaller i-10 was the best fit for me. And after using it for the past few weeks, I couldn't agree more. It is perfect. The concerns with going for a too large is that the phone would bounce around in the pocket and that would just be plain annoying. - Water Resistant. My phone is protected in the elements! No more putting it in a baggie to run with. I've run in the rain a few times and my phone hasn't gotten a single drop of water on it. - Double Zipper. It's so much easier to open the zipper while I'm running to grab another piece of gum with the double zipper. Whatever I need from the ArmPocket is easy to get and I can close it up with just one hand. - The COLORS! ArmPocket has a wide range of colors. Red, Pink, Yellow, Purple, Orange, Black, Splash (multi). You can choose a color that stands out, one that matches most of your outfits, or buy multiple. I prefer one that stands out. The Splash is a fun, collection of all the colors. - The ArmBand. It's thick. The velcro is very stick. The construction is solid. You can tightly tug on it and not have to worry about it tearing. The thick armband is awesome because you can make it snug and it won't cut into your arm. There's also padding to it so it's comfortable. Also, you choose an armband size when ordering. You'll have to actually measure your arm because you want it to fit correctly!!! I chose a small and it's perfect for me. But when my biceps get huge, I'll definitely have to size up. A few words about the ArmPocket website. It's fabulous. Easy to navigate. Easy to search for you perfect ArmPocket by device or by model name. And if you are still not sure, just contact the ArmPocket folks and they will help you choose the appropriate model. They know their stuff! And the pricing is great. They range from $19.99 to $49.99. It really depends on the size you are looking for and the amount of space you want. I think it's a great investment and a reasonable price. Now, for my fabulous readers. ArmPocket has offered a giveaway! The giveaway begins today and will close next Saturday, 11/9. I will announce the lucky winner on the blog and email. Winner will have 24 hours to respond or I'll choose another winner. Disclosure: I was sent a sample ArmPocket for a review. All opinions are 100% my own. I don't currently take my phone on runs but I know I should, for safety sake. This would sure help with that! Ive got an arm thing im not happy with at all. Would lovevto try this one! I don't really have anything to carry my phone and I think this would be great! I lost my old holster so I need a new way to carry my phone. I have an old armband contraption which is too small and not very water resistant, so the Arm Pocket will really help. I have yet to find something that works for me. I have been dying to try an Armpocket. So tired of keeping my phone in my belt. This would be much easier. Awesome. I usually just wear my spibelt where I can also clip my mace to. But if I am running during the day with hubby or on the river trails, I don't always wear the mace or want to mess with the spibelt BUT I might still want my phone. I carry it for safety more than anything else. that would be so nice I would love love love one of these! I've never had anything like this but I really want to give it a try. Does it rub? That's my main concern. I actually was just looking for something like this for my new Galaxy S4 (which is on the big side with the Otterbox I put on it). Today I ran with a jacket and overheated all because I wanted a pocket to carry my bank deposit and my phone. Would LOVE to win one. ArmPocket would be perfect for you!!! I do that sometimes. Well, used to. I love the ArmPocket! I haven't had any issues rubbing. But I've been wearing it with short sleeve and long sleeves. Definitely talk to customer service. They rock! Safety for sure! And I love how how easy it is to get my phone out! I've tried my phone in a belt and it didn't feel good! I think you'll love this! I think you will love ArmPocket! This is perfect for you, then! ArmPocket would be perfect for you! I recently upgraded my phone and it is now too big for my current armband and I have to carry it while I run. I would love an Armpocket! I currently dont bring my phone. Now that its getting darker earlier my husband prefers I take it. I have to hold it in my hand which worries me because I will inevidably drop it! This would be fantastic to have. This looks great. I usually stuff my phone into my fanny pack, but I don't always want someting around my waist. I carry my phone in one hand and mace in the other. no room for any fuel etc. This would be great! Am a new runner and don't have an arm band. I always carry my phone so I guess I don't use my arms either and overwork my legs (that already had me out for 5 wks b/c of injury). To take pictures and the occasional time I want to listen to music hands-free! Oh my I need a new arm band my current one is smelly and I love it has room for more then the phone! Pick me Pick me! I soooooo want to win this! Great review and I'd definitely pick the splash of color! It would help me with my running with the pocket, so I can put my keys. Almost all my pants don't have pocket.